Today was a very long day in the shop finishing off our first laser kit. Steve had come up with a new roof design, so it was a case of getting on Coreldraw and bringing the design to life and cutting out a roof piece to see what it was like. 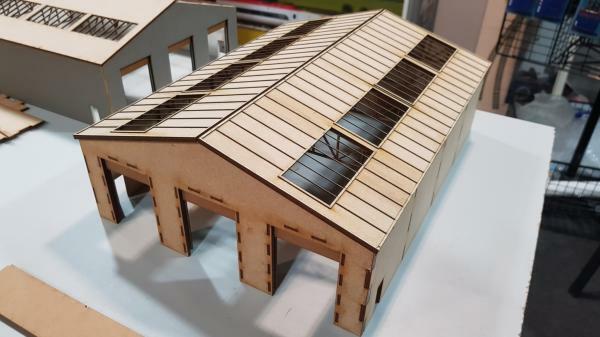 The roof is now two sections, a main section with the window holes cut out as previous, but this time, a second layer added in 0.8 mm to make an additional framework to place on top that would now incorporate the window outline. Delicately glueing this to the roof section, it looked really good and then a coat of grey primer added to see how it would look and now its impressive. We could just envisage this roof being weathered, so full marks for us coming up with a new roof design and a quick poll on the Facebook page gave us the nod that this is what everyone else liked. 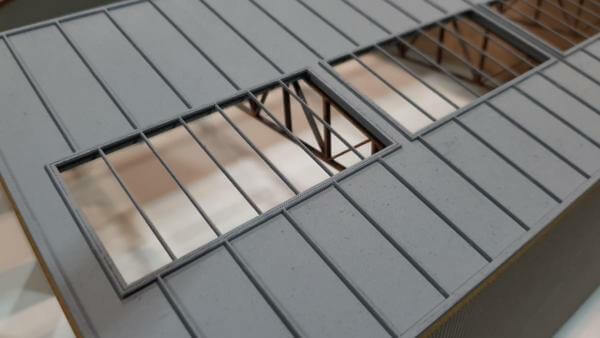 We’ll still most probably go with a kit for the old roof style as well to give everyone that option. If you’re at the Taunton Model Railway Exhibition this weekend, come and say hello to Steve and James. We’ll be on James’s DCC Train Automation stand showing pre-production kit.